When a player is absent, you will need to make a substitution. 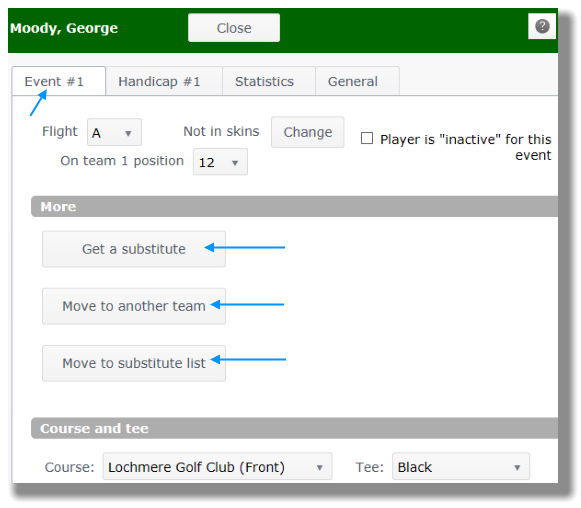 If the administrator enables the feature, golfers can find and insert their own substitute. Open Main Menu, click 1. Pre-Play and then click Manage. Click on absent player's name. Make sure that you are on the Event tab (see Figure 1 below). Click on button labeled "Get a substitute" (see Figure 1 below). 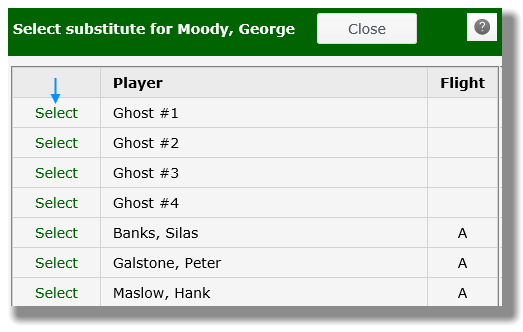 Click on the green Select link for a Ghost sub or an actual substitute player (see Figure 2 below). The substitute will appear beside the regular player (see Figure 3 below). Note that you can move a sub onto a team for more than one event at a time. Please see Move Players topic.